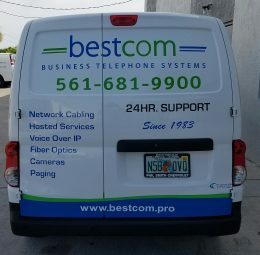 The new trucks are Chevrolet City Express mini vans; they are equipped with wire shelves in the rear of the van to allow for organized and efficient storage as well a Kargo Master ladder rack to accommodate two work ladders mounted on top of the vehicle. We are getting 26 miles to a gallon which is vast improvement from the 15 mile per gallon pickup trucks they replaced. Many thanks to Ace at Ace Custom Signs for the window tinting and graphics.